LoRa Radio Module is a type of long range low data rate data radio modem based on Sx1276 from Semtech. It is a low-cost sub-1 GHz transceiver module designed for operations in the unlicensed ISM (Industrial Scientific Medical) and LPRD bands. 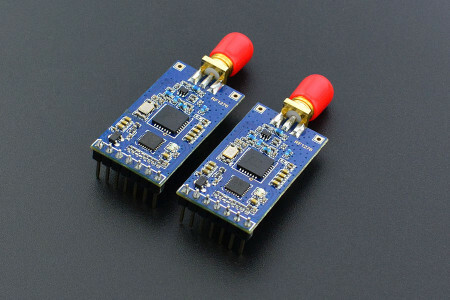 Frequency spectrum modulation/demodulation, multi-channel operation, high bandwidth efficiency and anti-blocking performance make LoRa modules easy to realize the robust and reliable wireless link. The module can work in two different modes: Standard mode and Star network mode. In the standard mode, it acts as transparent data radio modem which it communicates with the host at the preset data format without encoding / decoding needed. In start network mode, one module will be the configured to the central node and other modules are set to node modules. The communication between the central module and node module are bidirectional but the node modules can not talk with each other. Please note that the module doesn&apos;t contain lorawan protocol. Therefore the star network feature of this module is used with itself protocol so it is not compatible with lorawan.